Awarded one of Critiki’s Ten Best Tiki Bars in the World, nominated for a Tales of the Cocktail Spirited Award, winner of a Foodist Award for Best Cocktail for the Smoking Cannon - these are just some of the accolades racked up by UnderTow, Phoenix's beloved underground tiki bar. 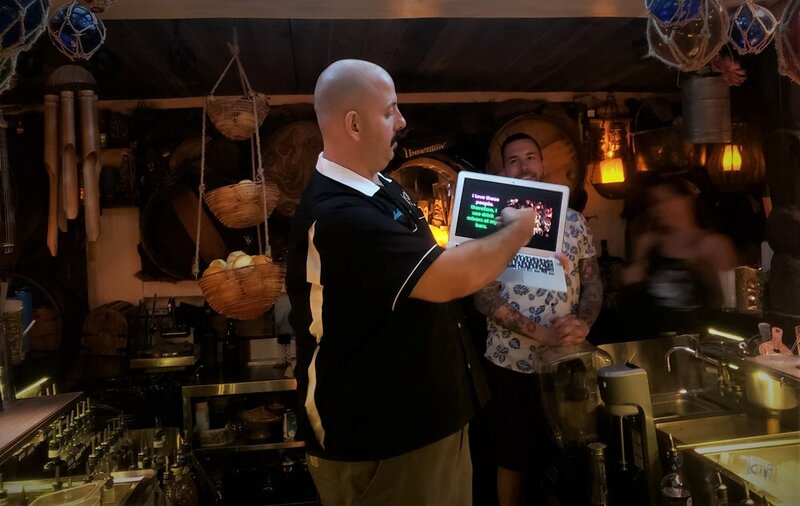 This summer, the renowned tiki lounge launched Savvy, a regular series of 90-minute tiki classes hosted by co-owner Jason Asher or visiting tiki experts from around the country. Usually held on the second Saturday of every month, these fun and educational classes regularly sell out. Each ticket includes admission for a 90-minute seminar, cocktails that will be highlighted during the class, and recipes. I can't think of a better setting to spend a boozy afternoon than this former 500-square-foot oil bay 'decked' out to mimic the cargo hold of a 19th-century clipper ship (complete with sound effects and ocean animation views from the portholes!). In August, UnderTow welcomed special guest Anthony Schmidt, one of the talents behind acclaimed San Diego restaurant and cocktail bars such as False Idol, Noble Experiment, Craft & Commerce, and Polite Provisions. Anthony referenced a mentor, the late Sasha Petraske, who always pointed out his classes were not limited to industry pros. "The central premise of the seminar is about home bartending because, essentially, if you can do this at home, you can do this with maximum efficiency in a professional setting as well." And most important is making your guests happy. He showed a picture of his False Idol regulars who gather for Mug Mondays in a happy group of 50. "This is our 'ohana, this is our family." But with a list of 103 ingredients in 38 cocktails at his bar, how does he keep their thirst quenched all at once with a perfectly-executed cocktail? "These people are extremely important to me, they preach the gospel of False Idol, and I need something that makes them happy." And thus he launches into a cocktail-changing part of history in his slideshow "Remember the Drink Mixer: A Lost and Found Story." We sipped on our first delicious cocktail made with the spindle drink mixer, Anthony's Sidewinder's Fang. "This one has a a special place in my heart. When I was young, my dad would go to the bar where this was made popular, the Lanai in San Mateo, while my sister and I would rip the place apart," Anthony said with a chuckle. It featured two types of rum, fresh lime and orange juices, passion fruit syrup and seltzer water, and it went down easy as we learned the mixer's origins and history. Anthony began with Frederick Osius inventing the fractional horsepower motor in 1911, which later found its way into the Cyclone Drink Mixer, an appliance that became indispensable in the era of malt shops and soda fountains. While Prohibition in the U.S. contributed to its popular use for malts and shakes in the 1920s, in the tropics of Cuba it was an integral machine for a different use - cocktails. "Cuba becomes a hot bed for the proliferation of the cocktail, where the daiquiri traditionally was known as Ron (rum) a la Daiquiri. At the time it was made with a stick from a swizzle bush and shaved ice, so the drink mixer became a faster, more efficient swizzle stick." Hence, it also became an integral part of the cocktail scene as bartenders embraced this more efficient and convenient way to whip up Cuban rum drinks. "Meanwhile,"Anthony continued, "Raymond Beaumont Gantt, aka Don the Beachcomber, is cruising around the Caibbean, combing the beaches, and learning what the bartenders are doing. He's in love with La Floridita, the famous restaurant and bar in Havana, and is watching the bartenders using this machine, and says, 'I've got an idea.' " This former bootlegger returns home and in 1933 opens up Don's Beachcomber in California serving tropical rum cocktails, and becomes the founding father of the tiki bar. He gave us a frosty example to savor with this education: The Dr. James, a riff on the classic Dr. Funk but using Two James rum and rye whiskey (False Idol has an exclusive barrel of Two James Doctor Bird rum), along with absinthe, demerara syrup, grenadine, lemon and lime, seltzer, and bitters. 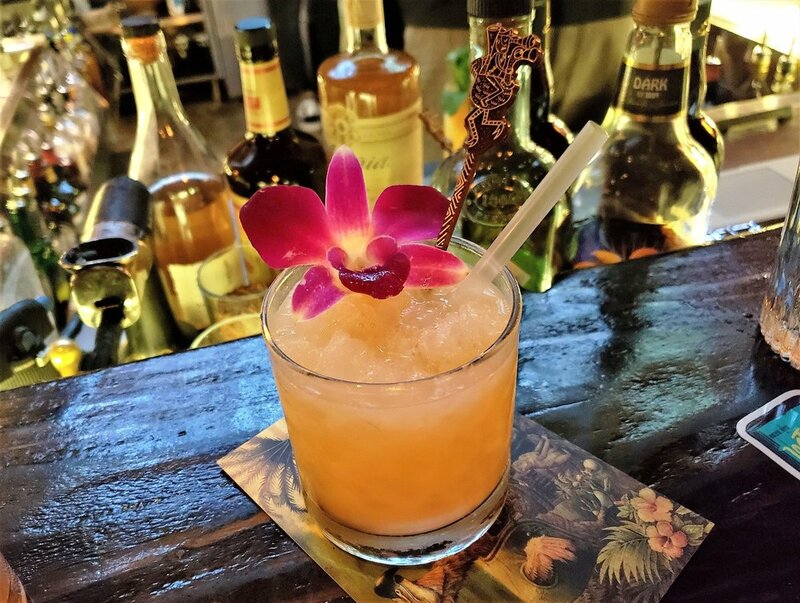 "Using this mechanism stretches all these intense spices in a way that becomes almost tropical tasting, and that is the magic that Don the Beachcomber achieved." "The drink mixer is not a blender," he emphasized. "A blender is going to blend ice into the drink and you have to add more sweetness because of that massive dilution. The drink mixer is mixing ice around the drink with a rapid chill while limiting dilution. I'm making drinks with maximum aeration, extreme speed, and minimal effort, and I can dedicate all my efforts to an elaborate set-up of ingredients and measurements." We learn that it's perfect for drinks using robust, layered ingredients and those with a thick consistency such as cream, sweetened condensed milk, eggs, and butter...yes, butter. "This machine does wonders with rich ingredients, not only rich rums, but rich in terms of fat" and our final drink is the Madre Perla, a modern take on the traditional Pearl Diver with its Gardenia Mix of honey, butter and spiced syrup. Its name is derived from how the mixer emulsifies the ingredients, creating irridescent bubbles that rise to the top. Trivia: Look for 1920s Pearl Diver glasses that are specially shaped to display these 'pearls'. 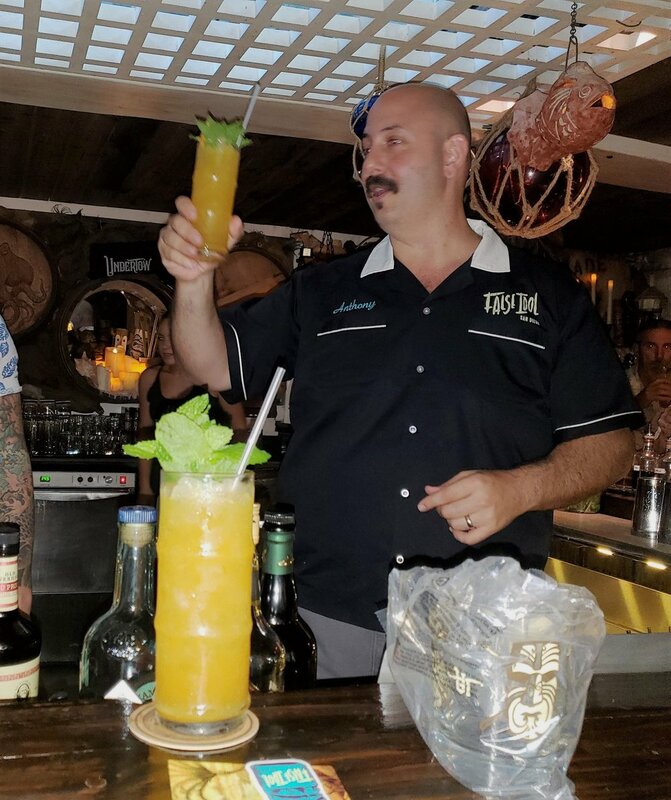 Anthony's rendition of this tiki classic was made with Azunia reposado tequila, Plantation OFTD rum, fresh lime and orange juice, and a Gardenia mix including cinnamon syrup, Giffard vanilla liqueur, honey, Hamilton Pimento dram, and melted butter. It was a fantastic finale to Savvy at UnderTow. Visit my website calendar or EventBrite for the upcoming UnderTow Savvy series, along with special Chef pop-ups and "Commandeer" events as Undertow is taken over by guest bartenders (and you can check out the unique atmosphere of UnderTow in this recent ABC15 video). And be prepared for UnderTow to embark on a new adventure in mid-September! It will be closed for two days to reopen as the "ship" travels up the Amazon. "You'll get new video content, new lighting, new sounds, new music, and new 'things' to make this place feel like the new menu," says Jason, "and the new menu is absolutely awesome." I received a complimentary media invitation to this cocktail class.